Switching to LNGNo mains gas? No problem. If your business is still running on oil, then there's a good chance you're paying over the odds. At Flogas we offer a greener, more efficient system - Liquefied Natural Gas (LNG). A simple switch from oil to LNG could bring big savings on your energy costs, as well as reducing your carbon emissions. LNG is now a readily available fuel for the UK market which offers many benefits to businesses like yours and it's the ideal alternative to oil. LNG is created by cooling natural gas to an extremely low temperature (-162ºC). This cooling process turns the gas into a liquid that takes up 600 times less space than when it's a gas. This means it requires less storage capacity. It's incredibly lightweight, too. In fact, it's lighter than water - which makes it easier to get to you. What's more, it's non-toxic and non-polluting - which means a safer, more environmentally friendly fuel for your business. All of these benefits make LNG ideal for off-grid high energy user looking for a cleaner, greener, more cost-effective alternative to oil. LNG is specifically for high-end energy users not currently on mains gas. It is the smart choice for saving on energy costs, whilst improving your carbon footprint. If you are using a significant amount of oil (kerosene, gas oil or HFO) for heating or any industrial process or production, replacing your oil fired systems for a more efficient LNG fired equivalent could deliver the savings your business craves. 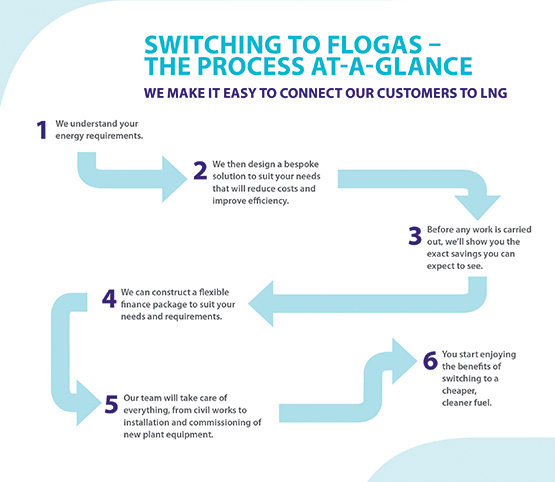 Choosing Flogas as your LNG supplier is the right thing to do.